To Claude Cahun, artist, photographer and writer. From Cherry Styles. I went to a talk about you last weekend, and watched a documentary about your life and work in Jersey with Suzanne [Moore]. Lots of your photographs have been special to me throughout my life but I knew very little about your life, and the way you and Suzanne made lots of the work together. One of the things that struck me – I mean floored me + I haven’t been able to stop thinking about was the stark comparison of the photos Suzanne took after you died. 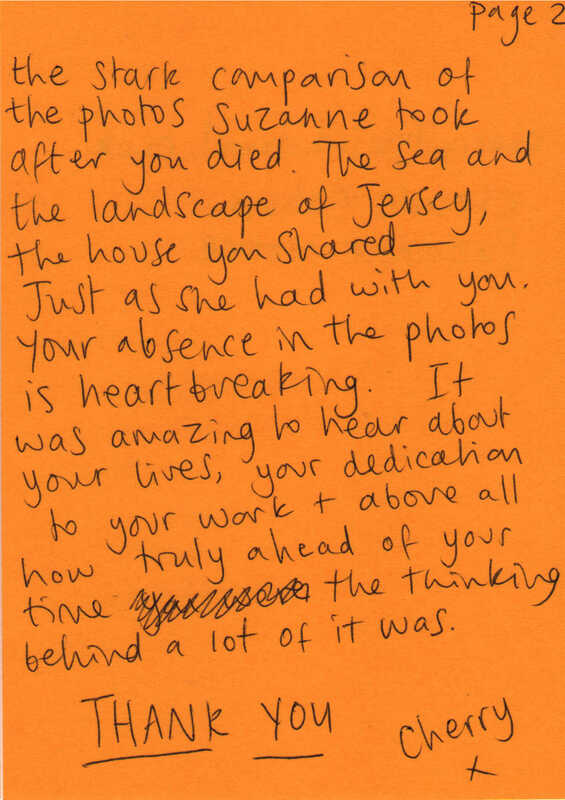 The sea and the landscape of Jersey, the house you shared – Just as she had with you. Your absence in the photos is heartbreaking. It was amazing to hear about your lives, your dedication to your work + above all how truly ahead of your time the thinking behind a lot of it was. artist, photographer and writer. Born 1894, died 1954. More information about Claude Cahun.